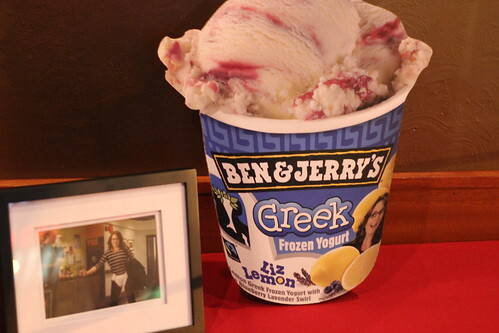 Blondie and Brownie: Ben & Jerry's Liz Lemon Tribute! Less than an hour before last night series finale for 30 Rock (epic sad face at its ending), Jerry of Ben & Jerry's announced their latest flavor, one made in honor of 30 Rock's demise. And it didn't involve muffin tops. 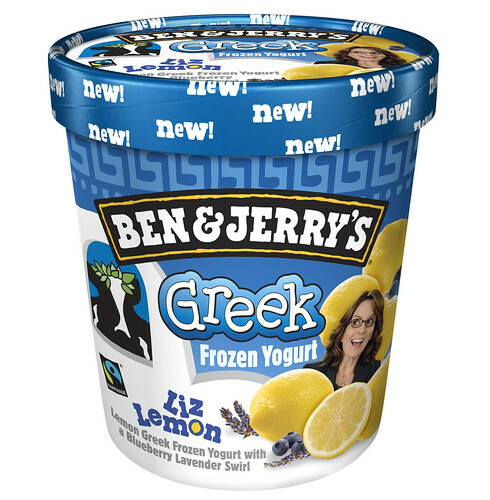 Keeping with their push to increase the new Greek Frozen Yogurt line--pints of which I personally enjoy every now and then--the new flavor is Liz Lemon. The lemon yogurt is tangy in a good way, not pucker face, but a little zesty. It's evened out with the sweet and savory aspects from the blueberry and lavender swirl. I kept thinking how this would be a great spring and summer flavor, for when it's getting hot out, but you don't want that "blah" heavy feeling that can happen after an entire pint a small serving of ice cream.